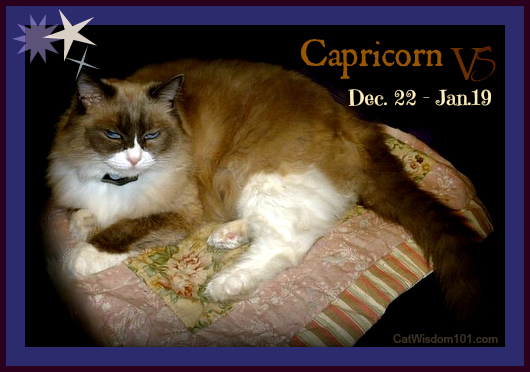 Capricorn Cats are born between December 22 and January 19. If you aren’t certain of your cat’s birthday, see if this profile fits. Capricorn is the 10th sign of the zodiac and ruled by Saturn. Their element is earth. The symbol is the goat and their colors are purple and brown. The Capricorn cat is grounded and calm, steady and cautious. The young ones seem wise beyond their years while the old kitty goats grow more kittenish with age. The first clue your cat may be a Capricorn is the expression on their face. Tard aka Grumpy Cat comes to mind as does Henri le chat noir of existential fame. Matilda (pictured above) the resident cat at the Algonquin Hotel in New York appears to be a quintessential Capricorn kitty even though she celebrates her birthday in the summer. Regardless of the breed, a Capricorn expression is on the serious side of peevish. But don’t let a grumpy face fool you; this cat has many notable traits, above all patience and persistence. They adapt quickly and easily to new homes but if things are not to their liking they have no qualms about finding a better situation. They will patiently wait for a mouse, a treat or for their late human to get home. If they choose you, and you treat them well, you’ll be rewarded with loyalty and a good solid cat. They aren’t overly demonstrative but give the affection you deserve. No more no less. To make them happy they thrive on a consistent schedule of healthy meals, play (with or without you) and some kind of work or purpose. If you work at home, they will happily be your office assistant. Matilda is a good example of a working cat who plays her part of hotel ambassador to a T. She extends her gracious and earthy energy to all those who appreciate it. But always practical, she hides when she’s done. At the hotel she can be found napping off duty in the baggage room. Capricorn cats like to be well groomed and told how beautiful they are despite any flaws. But no BS, they’ll know if you’re lying. They’re highly intuitive. You won’t find them jumping on precarious ledges or other dangerous situation. Whether social climbing or bookcase climbing, they like it high and luxe. Capricorns like material things. They assume every room in your house and every thing in it belongs to them. They can be trained to walk on a leash but with their quiet and methodical ways are just as likely to train you to do their bidding. The calming earth signs of Capricorn, Virgo and Taurus are good for nervous types. They aren’t wild thrill seekers like Geminis, social butterflies like Leos or super sensitive Scorpios. If you like a no-nonsense cat with a slight selfish streak, the queen of serene Capricorn cat may be for you. Matilda rules the roost at the always elegant and serene Algonguin Hotel. If you stop by and visit, be sure to tell her she’s the cat’s meow. I am curious to find out what blog platform you’re using? I’m having some small security issues with my latest website and I would like to find something more safe. Do you have any solutions? I was suggested this web site by my cousin. I’m not sure whether this post is written by him as no one else know such detailed about my trouble. Really cool blog post. I just uncovered your blog and want to state that I’ve really enjoyed browsing the articles you write. Maybe a Capricorn kitty is what our Mica Minnie Moo needs! A good reliable kitty to her skittishness. We need to check out our sign and see if it matches us. Texas, I’ll check out the contest. I don’t think I purrsonally know any Capricorn kitty, but now I’ll recognize one when I see one. Thanks! So interesting to read that! We definitely don’t have Capricorn cats over here!